Recently Prince George County decided to participate in the failed “Secure Communities” program. The protest was sparked by the case of 26 year-old Florinda Fabiola Lorenzo- Desimilian of Gables Residence, who was arrested last Tuesday for selling $2 telephone cards without a license in her home, taken into custody leaving her 13 month old baby, 5 year-old and 10 year old in the custody of her parents, and subsequently transferred to ICE custody by the County. 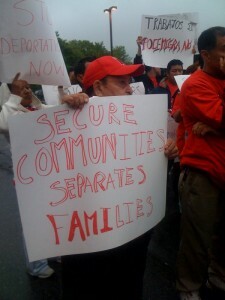 On Monday night, CASA of Maryland staged a protest outside the Prince George’s County jail. About 60 members of the county’s Latino community are calling attention to Lorenzo-DeSimilian’s case. They’re blaming correctional officials for sending her fingerprints to the FBI, Fox 5 reports. A protest is planned Monday to fight the possible deportation of a 26-year-old Langley Park mother who was arrested for selling phone cards without a license from her home. This entry was posted in Events (Maryland), Press (Maryland), Video on April 27, 2010 by Ian.